I don’t like shopping online. Is there any other way I can buy from Costume Direct? Does Costume Direct ship overseas? 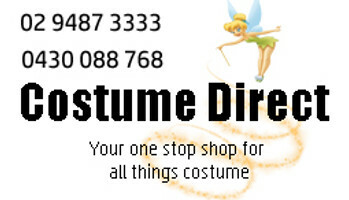 Does Costumes Direct have a shop front? What if Costume Direct does not have what I want? What if the costume does not fit? How do I unsubscribe from news and offers via e-mail? How do I know if an item is in stock in the online costume shop? Click on item in question and its details will include Availability. Availability will be either ‘In stock’ or ‘Out of Stock’. Of items shown to be ‘In Stock’, not all sizes/colours may be available. If you choose your desired size/colour under ‘Select Options’, you will be informed below the selection box if that version of the item is ‘out of stock’. We might have stock coming soon or be able to order it in for you. We want you to get the best fit possible, so we have included sizing charts for different brands of costumes. If you’re tossing up between a couple of sizes, it’s normally safest to order the larger size. If you need further help, we would be happy to assist you, just contact us.. Upon completing your order, you will be sent an e-mail (to the e-mail address you gave us during the checkout process), confirming that you have placed your order with us. You may also receive e-mails notifying you of the status of your order. One of our aims is to provide a safe and secure online shopping experience to all of our customers. We are secured by Secure Pay and your details are encrypted before being sent to us. You can rest assured of a safe online purchase. Otherwise you are more than welcome to place an order over the phone, or to walk into our retail store in Hornsby. You can use Visa/Master/AMEX/Paypal to pay for your purchase online. That being said, if you would prefer not to shop online, please select all items you would like (on the product page click ‘Add to Basket’, until you have all the items you would like. Then click Shopping Cart) and then give us a call (02) 9487 3333 we can take your order details and personal details over the phone. Alternatively you can add items to your basket and then send us an e-mail with a Screenshot of your Shopping Basket attached. Please provide us with your Name and Phone number and we will call you (usually within 24-48hrs) and get additional details. Another option is if you place your order with us and select ‘Pay by Cheque / Money Order’ at the Payment options screen during the checkout process. Then send us the Cheque/Money order to the value of your order. We are unable to process your order until we receive your Money Order. It depends on the circumstance. Please see our refund policy for more details. In our aim to get your orders shipped to you as soon as possible, our system automatically process your orders. Because of this we CAN’T alter or change your order after you have submitted it. We ask that you double check all details before submitting the order. Please ring us (02 9487 3333) ASAP if you discover a mistake in your order. You may be able to catch us before we have sent the order, in which case we are able to refund both merchandise and shipping costs. If not though, you will have to receive the ordered products and return them for a refund. If this happens we can’t refund the cost of shipping and handling. We apologize for any inconvenience caused as a result. Shipping charges are outlined on the delivery page. Please contact us sales@costumedirect.com.au for exact shipping charges for overseas orders. If you place your order before 3pm (Sydney Time, on a weekday) we will send your order the same working day. If you place your order after 3pm, your order may not be sent until the following working day. The amount of time your order takes in the post varies depending upon where you live. We send orders with Australia Post Express Post Service or by a variety of couiers to ensure your order arrives on time. Your order may be delivered in multiple parcels to ensure the fastest delivery. Typically you can expect it to take between 1 and 3 days. It normally takes between 1 and 5 working days from placing your order to having it delivered to your door. In order to get your order delivered to you as soon as possible, some items may be shipped in separate parcels. This is at no extra cost to you. Your online security matters to us. Credit card information and details are encrypted before being sent to us. Secure-Pay ensures our shopping cart is safe for customers. Payment can be made via Paypal. However the purchase costumes can not be browsed. So once you know the costumes you are interested in, our lovely salespeople will be more than happy to gather those up for you. Please contact us if there is a costume or accessories you would like but which we do not stock online. Chances are one of our suppliers may have it and we can order it in for you. You can request a special-order for most of the items in this website. Please refer to sizing charts and/or contact us if you are unsure which size to order. If you order a costume and it does not fit, you are welcome to return it to us for a refund or exchange. Please see our refund policy for more details. You can. To have the order delivered to their place fill in their address as the ‘Shipping Address’. Please see our No Worries Returns Policy. Asides from saving time at the checkout for your next order, members are given special discounts and promotional codes. You can pay via Visa or Master Cards or by using PayPal. If you have any further questions or comments, we would love to hear from you. You can ring us or e-mail us. Discounts on our already cheap prices are available through e-mailed special offers. You can unsubscribe at any time by clicking the unsubscribe link at the bottom of the email. You will receive e-mails at various stages of the process to let you know how your order is progressing. Yes, provided we are contacted before 3pm EST on the day we are due to ship your order and have not yet packed it. We've outlined the procedure below and details of associated shipping costs. If you would like to add something to your order, please contact us over the phone (02 9487 3333) immediately. We pride ourselves on our efficiency in processing your order. If you catch us before 3pm on the day we are due to ship your order and your order has not been packed yet we will be able to add items to your order. We will require payment for the additional items you wish to add and will send them with your original order with no additional postage cost. If you create a new order online before we pack and post your original order for additional items and are getting them shipped to the same address, we will ship both orders together. Unfortunately we will not be able to refund you for the postage of the second order you placed. This is why we always recommend calling us if you would like to add something to your order. If you contact us after 3pm on the day we are due to post your order or after we have packed your order, you will need to place a new order for the extra items you would like and pay for postage of your second order to you. *Please note: If you have ordered something using a group-buying site voucher, you can only use 1 voucher per order. If you have placed two separate orders using group-buying vouchers within a short period to be sent to the same address we will ship them together. We are not able to refund you the cost of the postage of your second order.